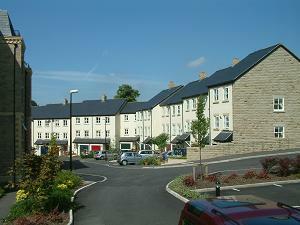 An early 2000s development of a five story block of apartments (Dyers Court) together with a curved terrace of three story houses built by Linden Homes on the site of Higher Mills. Approach off Ingersley Vale just by the end of Church Street. Nearest pubs – Crown, The Turners, Church House. There were two mills at Higher Mills adjacent to a large mill pond. The pond was reduced by nearly half to increase the development area for the houses. Bollington’s brewery, Heaver’s, was located here in the older of the mills; it burnt down in 1931. In the mid 1920s a company called Radion’s had part of the mill for repairing radio valves. Latterly Shrigley Dyers, ‘We Live to Dye!’, used the remaining premises until about 2000. A fuller history of brewing at Higher Mills is available, also more on Radions. The original late 18th century three storey block stood at the bottom of Lord Street, Bollington, on a roughly north-south axis, with the mill pool to the east. Part of the pool has been preserved. The original mill was 10 yards wide, and reached 36 yards in length (12 – 14 bays), though it may have been lengthened in stages. A taller and wider block, 12 yards wide, 30 yards long (10 bays), with four storeys was added close to the south end of the original buildings, extending westwards at a right angle to them, in the 1830s.